American editorial cartoonists are on a bit of a roll (as well they should be, with all the material they have been handed). 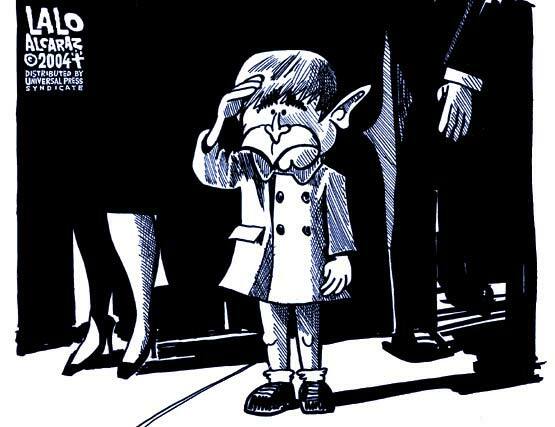 This brilliant one (or here or here) by Lalo Alcaraz, of Bush at the Reagan funeral, of course refers to this famous photograph of John F. Kennedy, Jr. saluting at his assassinated father's funeral. The extra joke is that the same Republican-connected High Cabal behind such deeds as that assassination, the October Surprise that slid Reagan into power (not to mention the upcoming October Surprise), and 9-11, were also possibly behind the assassination of John F. Kennedy, Jr. himself.